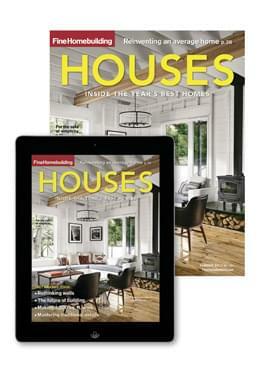 Fine Homebuilding magazine’s annual HOUSES Awards celebrate the most well-designed and well-built homes in North America. Every year, hundreds of homes are considered for recognition in six award categories. Together, they offer a snapshot of the most progressive design ideas and construction techniques being executed by today’s top architects and builders. The winners of the coveted HOUSES Awards are featured in the pages of the annual HOUSES awards issue, the industry’s premier design resource, and digitally through extended photo galleries and inspirational design videos. Unlike any other architectural-awards program, the coverage these projects receive is deep, comprehensive, and practical. Not only do we aim to recognize these houses for the quality of their design, but we strive to highlight the valuable design lessons within each project — lessons that can inspire and inform designers, builders, and homeowners across the globe. For our Best New Home, we look for the project that successfully met its design challenges with a superior level of craftsmanship and detail appropriate to its architectural style. Our Best Remodel award goes to the project that successfully identified problems with an existing house and solved them with practical design solutions and construction techniques. Our award category targeting homes under 2000 sq. ft. focuses on functionality of living spaces, material choices, exterior details, budgets, and construction techniques. This award will go to the new home or remodel that best exemplifies a traditional architectural style. The best project will be contextually appropriate and executed with authentic detail. Here, we look for a project that incorporates a climate- and site-specific approach to energy efficiency that respects the lifestyle needs and budget constraints of the homeowners. The Editor’s Choice award is sure to stir debate in our office. Designed to recognize innovation, aesthetics, or ingenuity (or a combination of all three), this award always offers a surprise.